Cook and drain fettuccine and broccoli as directed on fettuccine package. Toss with 2 tablespoons of the dressing. Cover to keep warm. Meanwhile, spray 12-inch skillet with cooking spray; heat over medium-high heat. Add chicken and onion to skillet; sprinkle with garlic-pepper blend. Cook 4 to 6 minutes, stirring occasionally, until chicken is no longer pink in center. Stir bell peppers and remaining dressing into chicken mixture. Cook 2 to 3 minutes, stirring occasionally, until warm. 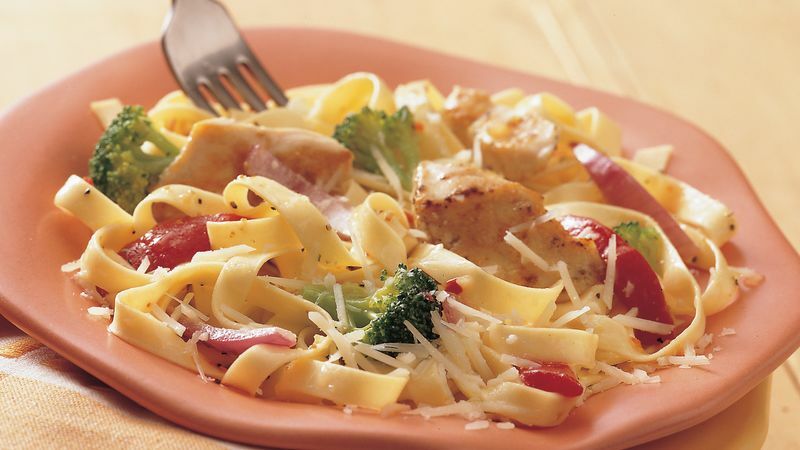 Serve chicken mixture over fettuccine and broccoli. Serve with cheese.